After discovering brothers playing on two opposing team scheduled to play ACL Match Day 1, I organised a photo shoot with the brothers from Beijing Guoan (CHINA) and Newcastle Jets (AUSTRALIA), with resulting image accompanying my “ACL Launch” media release. Coverage resulted in articles in 4 X Beijing newspapers, FourFourTwo (Australia) (print and online) and television news coverage on CCTV5. See below some images from the photo shoot with Xu Lunlong, brothers Ryan Griffiths, Joel Griffiths and Tao Wei of Beijing Guoan. 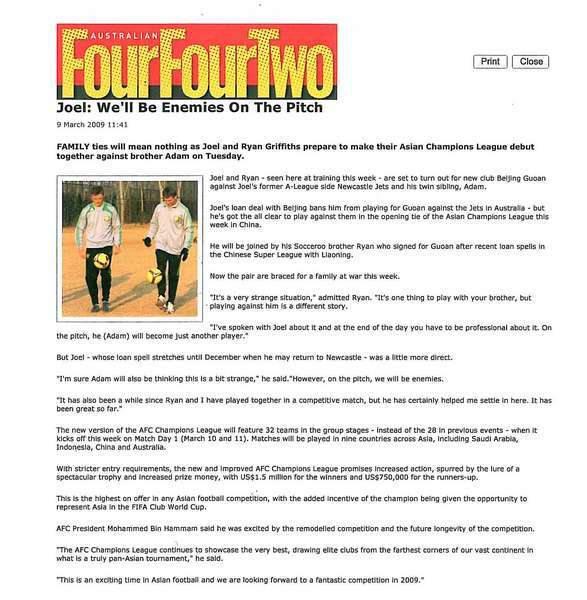 Joel’s twin brother Adam plays for Newcastle Jets (also Joel’s former club), which made for an interesting story angle. Can see the FourFourTwo (Australia) online article below too. Of course I made sure to throw in some Nike kit and balls, to ensure our sponsors were getting additional coverage wherever possible. This entry was posted in ACL, LinkedIn, Nike, Publicity. Bookmark the permalink.